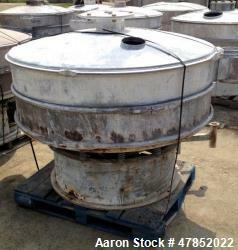 Below is Aaron's inventory of unused and used circular screeners. 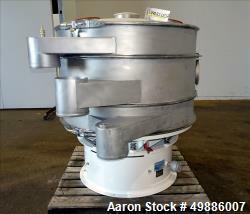 If you are looking to sell your used circular screener submit a request online or contact Erik Eichert at 630-238-7480. 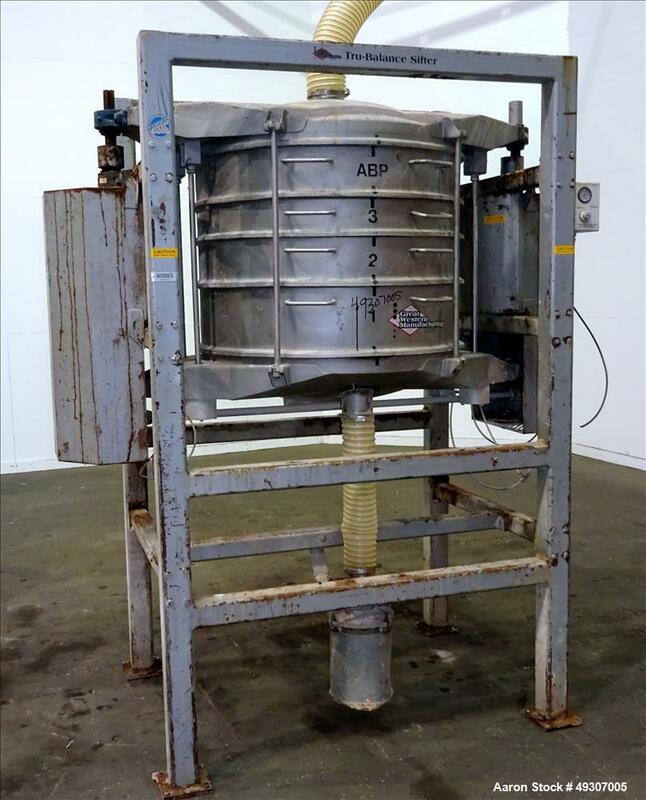 Used- Russel Finex Stainless Steel Sifter, Model 16300. 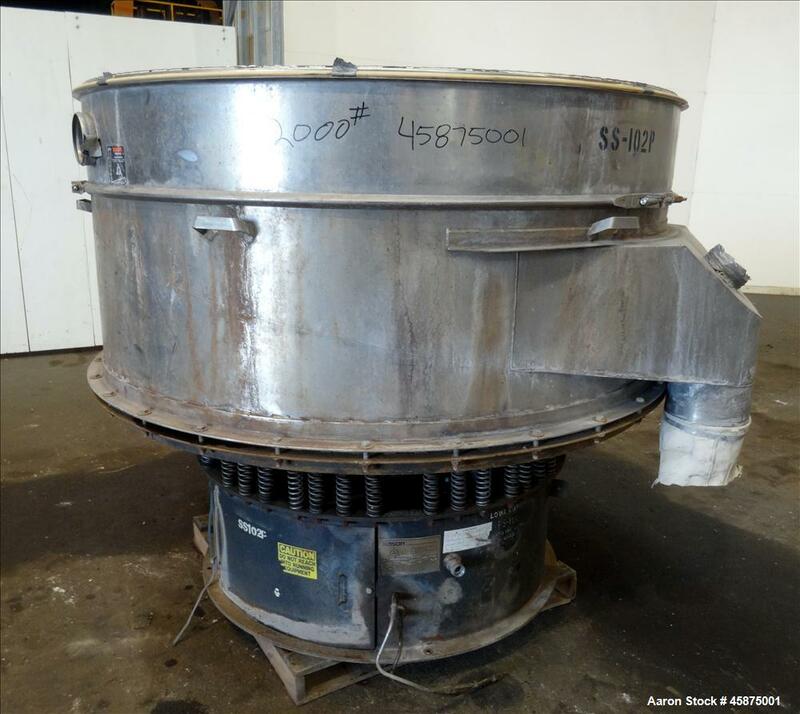 Used- Russel Finex Sieve, Model 16300, Stainless Steel Construction. Base mounted. Serial# A1906. 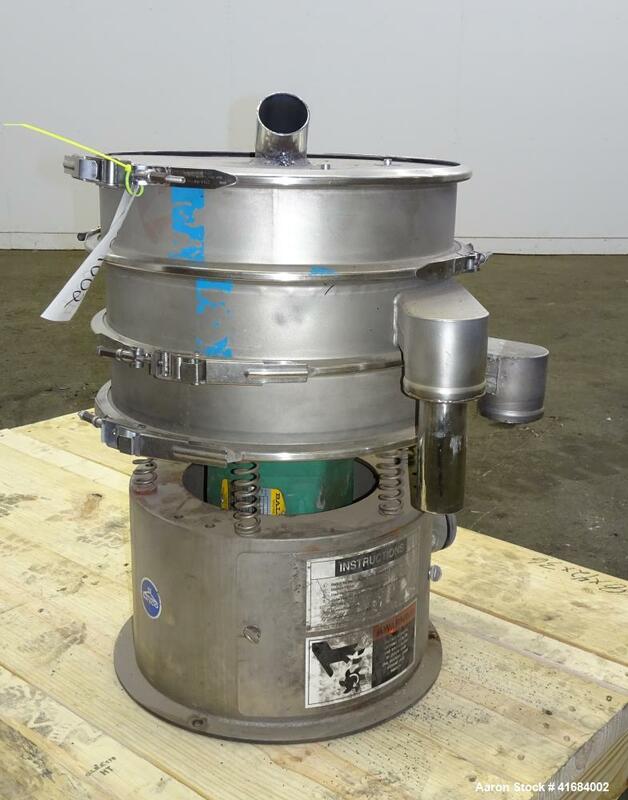 Used- Russell Finex Eco Self-Cleaning Vertical Filter, Model 26400E50ESJ, 304 Stainless Steel. Driven by a (0.20) hp, 3/60/280/480 volt, 1630 rpm motor. Maximum working pressure 145 psi. 2" Tri-clamp inlet/outlet. Missing internals. Mounted on a carbon steel frame with casters. Built in 2005. 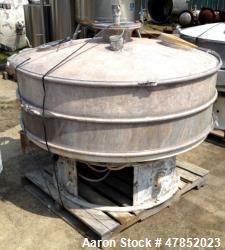 Used- Sweco Screener, Model LS18S333, 18" Diameter, 304 Stainless Steel. 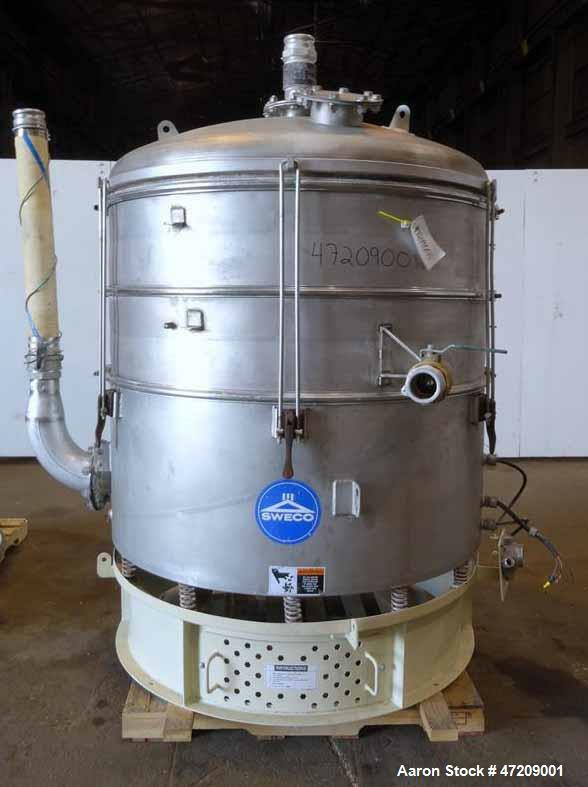 Used- Sweco Screener, Model LS18S333, 18" Diameter, 304 Stainless Steel. Double deck, three separation. Driven by 1/4HP, 3/60/460 volt, 1140 rpm motor. Top clamp on cover with approximate 2" inlet. 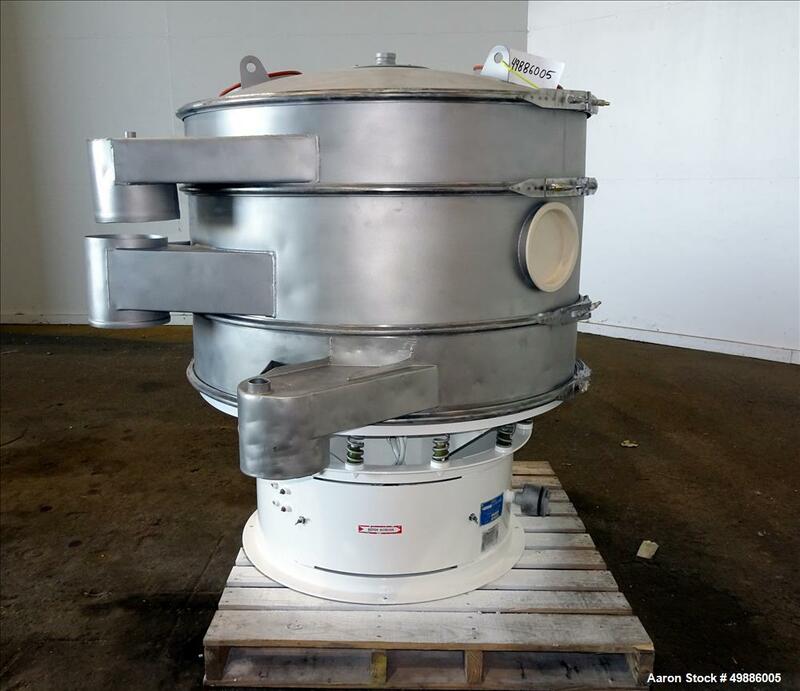 Mounted on stainless steel base. Serial# 721049-A399. 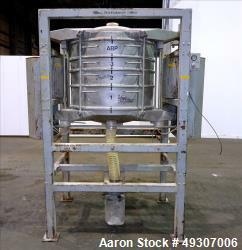 Used- Sweco Shaker Screen, Model LS 24C4444. 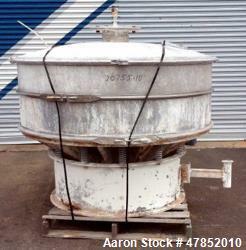 24” diameter screen, steel construction, 1/3hp Baldor electric motor 440vac 3 phase. Used- Gump Vibratory Screener, Model CV-301, 30" Diameter, 304 Stainless Steel. 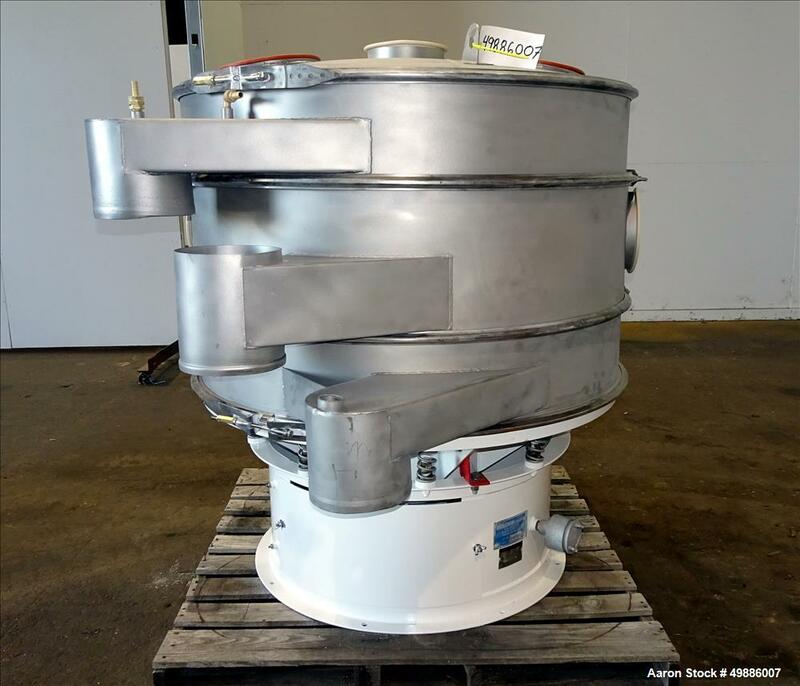 Used- Gump Vibratory Screener, Model CV-301, 30" Diameter, 304 Stainless Steel. Single deck, 2 separation. 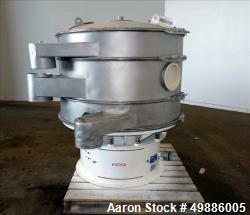 Driven by a 1hp, 3/60/460 volt, 1140 rpm motor. Mounted on a painted carbon steel frame. Serial# CV-2404. Used- Russell Finex Compact Sieve, Model 17900, 304 Stainless Steel. 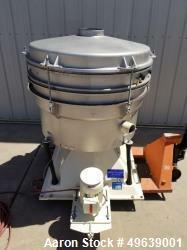 Used- Midwestern Industries Sifter/Scalper, Model MR36S24. 304 Stainless Steel. 36" Diameter, Single Deck. Driven by a 2.5 HP, 3/60/230/460 volt, 1200 rpm motor. Side discharge. Mounted on stainless steel base, mounted on frame. Serial # 02033605. 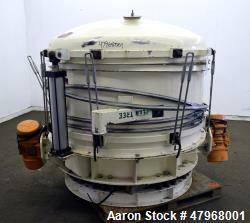 Used- Minox Tumbler Screening Machine, Model MTS1000/2. 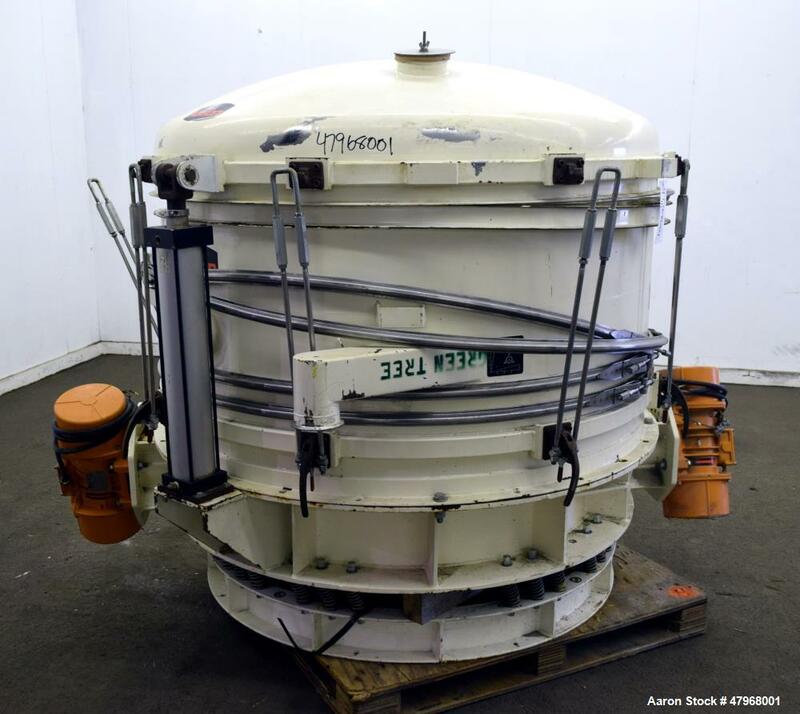 1000MM diameter (39.3"). 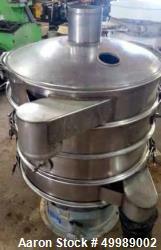 Stainless Steel, Double Deck, 3 Separation, Stainless Steel Top Cover. Driven by a 3 HP, 3/60/255-460v Motor. Mfg. 2002. 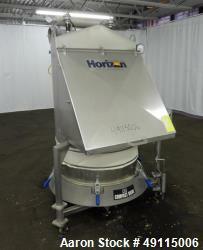 Used- Kason 40" Vibra Screen, Model K40-3-SS, Stainless Steel. Triple deck, 4 separation, no top cover. Driven by a 1/2 hp, 3/60/230/460 volt motor. Mounted on carbon steel base. Serial # M-10884, Job # K-119431. Built 2016. Used- Dewco 48" Diameter Vibratory Screener, 304 Stainless Steel. 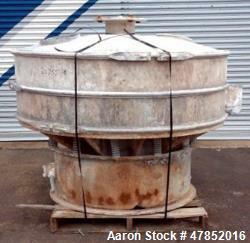 Used- Dewco 48" Diameter Vibratory Screener, 304 Stainless Steel. Double deck, 3 separation. Includes a top cover. Driven by a 2.5 hp, 3/60/230/460 volt, 1160 rpm motor. Mounted on a carbon steel base. Serial # 4888-73. Built 1992. 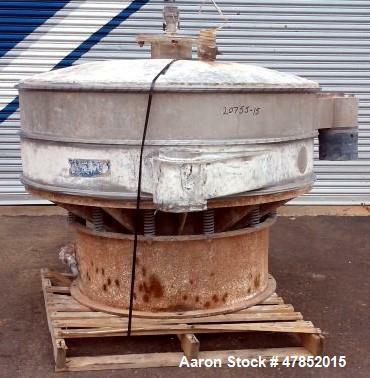 Used- Dewco 48" Diameter Vibratory Screener, 304 Stainless Steel. Single deck, 2 separation. Driven by a 2.5 hp, 3/60/230/460 volt, 1160 rpm motor. Mounted on a carbon steel base. Serial# 4888-76. Built 1992. 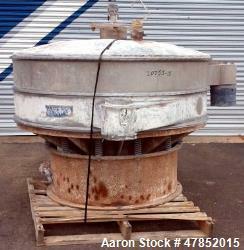 Used-Dewco 48" Diameter Vibratory Screener, 304 Stainless Steel. Double deck, 3 separation. Includes a top cover. Driven by a 2.5 hp, 3/60/230/460 volt, 1160 rpm motor. Mounted on a carbon steel base. Serial # 4888-72. Built 1992. 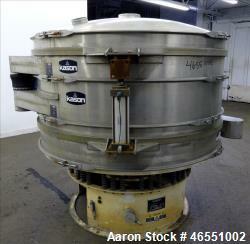 Used- Macon 48" Diameter Vibratory Screener, 304 Stainless Steel. Double deck, 3 separation. Driven by a 2.5hp, 3/60/460 volt, 1160 rpm motor. Mounted on a carbon steel base. Serial# 4888C-169, built 2003. 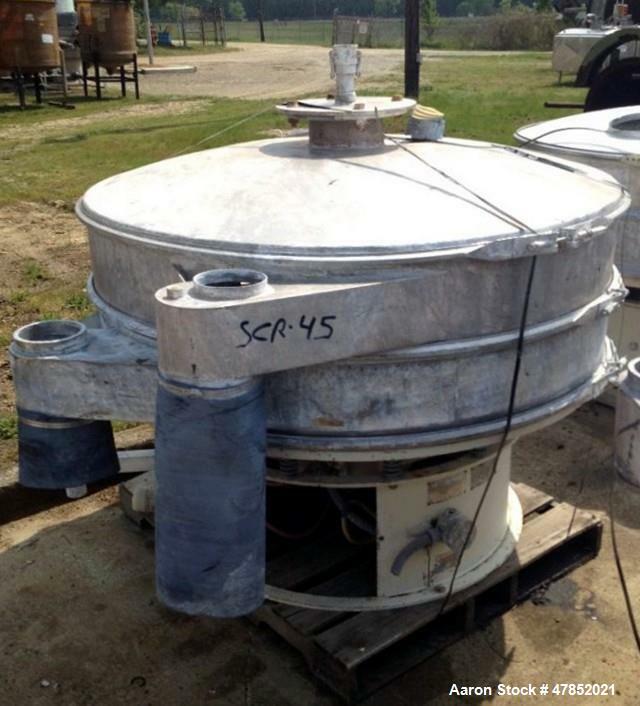 Used- Dewco 48" Diameter Vibratory Screener, 304 Stainless Steel. Single deck, 2 separation. Includes a top cover. Driven by a 2.5hp, 3/60/230/460 volt, 1160 rpm motor. Mounted on a carbon steel base. Serial# 4888-79, built 1992. 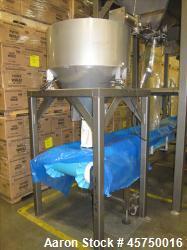 Used- Microner 48" Screener. Stainless Steel. Model #GS60-1HC-SS. 480v across the line starter with local disconnect. Driven by 7 hp motors. 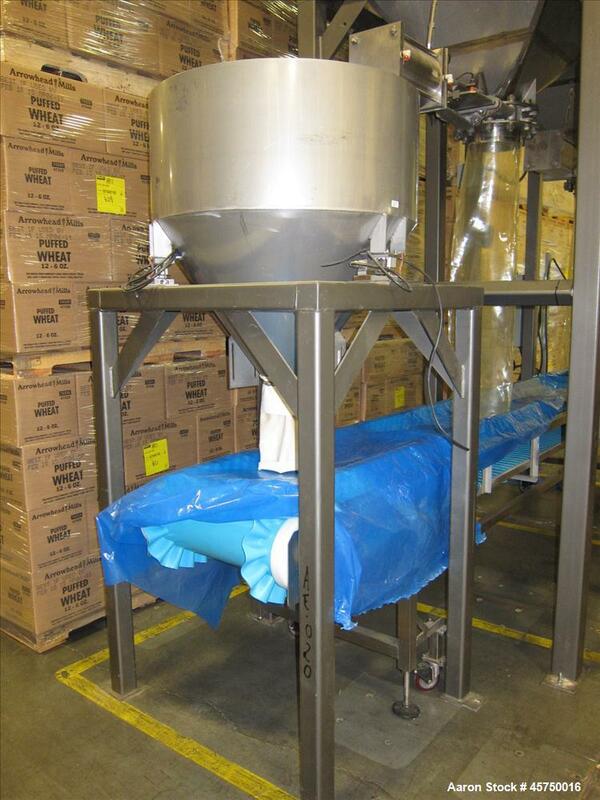 Includes removable stainless band, carts, extra screens, control box and local disconnect. 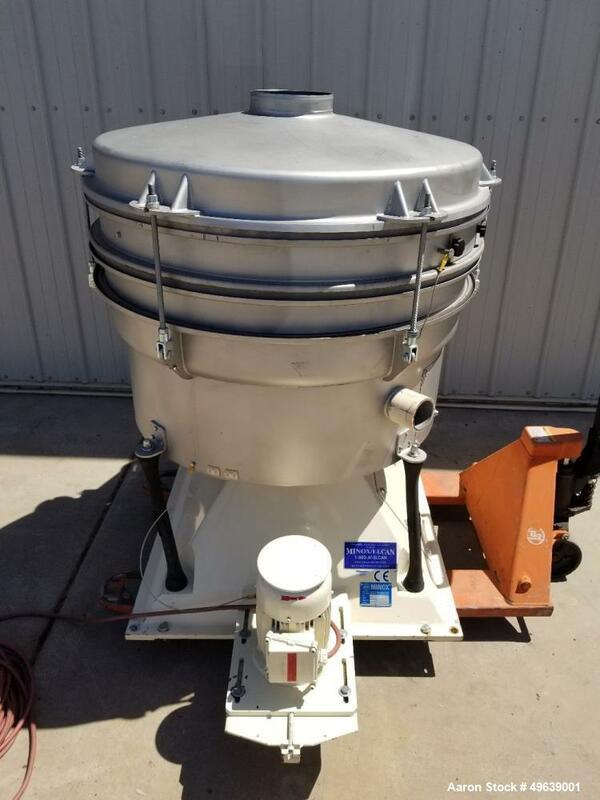 Used- Custom Advanced Connections Screener, Model R60C158WC. 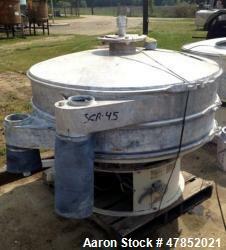 Used- Custom Advanced Connections Screener, Model R60C158WC, Carbon Steel. 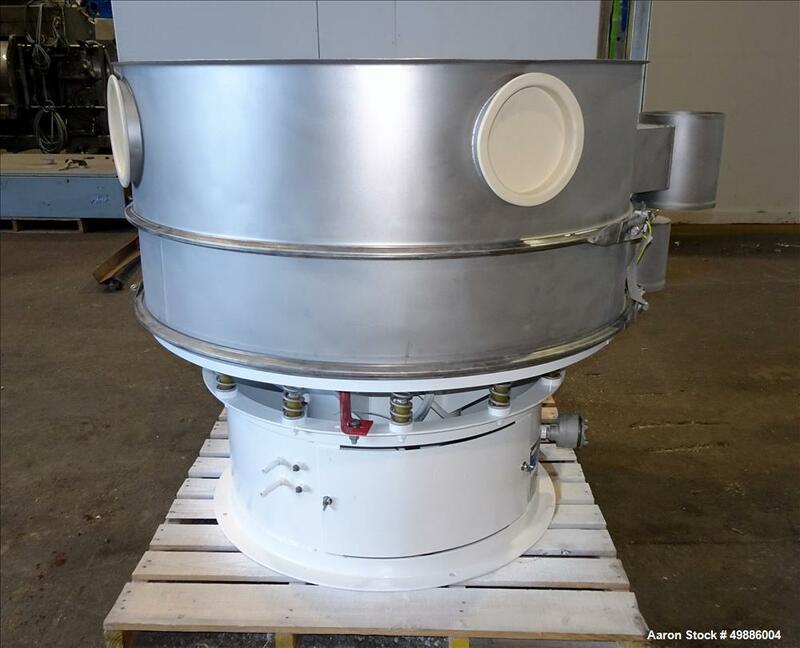 60" Diameter, single deck, 2 separation with top cover. Driven by a 2.5 hp, 3/60/230/460 volt motor. Mounted on a carbon steel base. Serial # 101305. 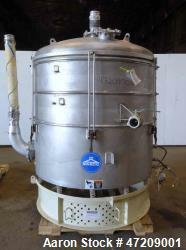 Used- Sweco 60" Vibro Energy Separator, Model LS60C88, Stainless Steel. Used- Sweco 60" Vibro Energy Separator, Model LS60C88, Stainless Steel. Single Deck. Driven by a 2.5 hp, 3/60/460 volt motor. Includes top cover. Serial# LS60-274-6. 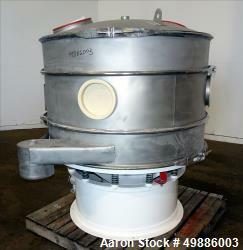 Used- Sweco 60" Vibro Energy Separator, Model LS60S8888, Stainless Steel. 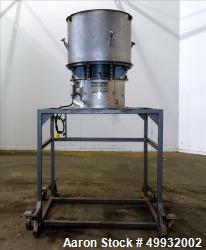 Used- Sweco 60" Vibro Energy Separator, Model LS60S8888, Stainless Steel. Single Deck. Driven by a 2.5hp, 3/60/460 volt motor. Includes top cover. Serial# LS60-479-60. 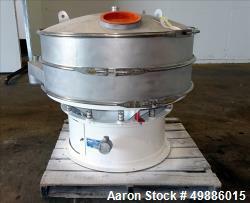 Used- Sweco 60" Vibro Energy Separator, Model LS60C, Stainless Steel. 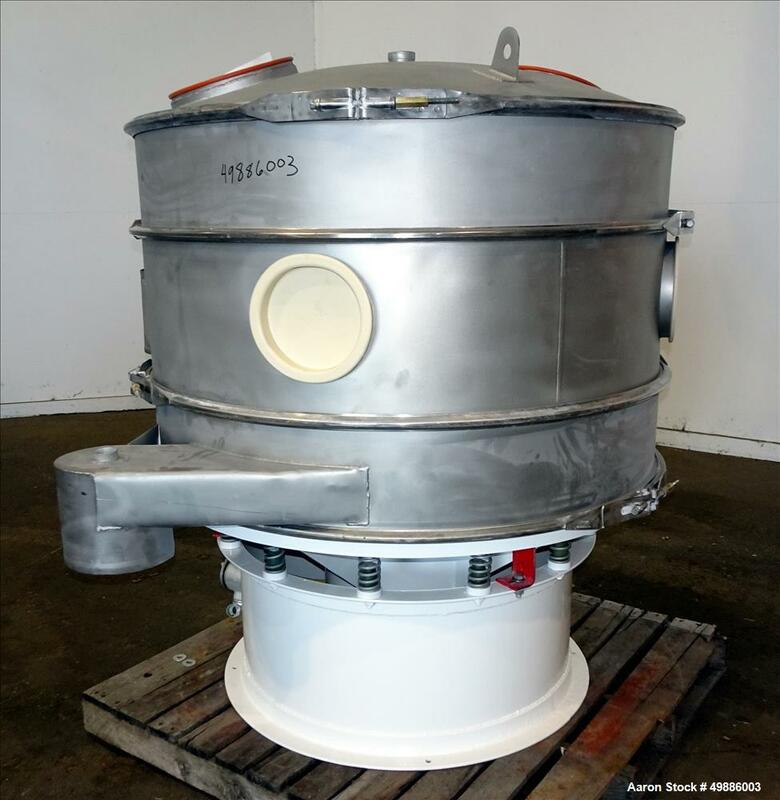 Used- Sweco 60" Vibro Energy Separator, Model LS60C, Stainless Steel. Single Deck. Driven by a 2.5hp, 3/60/460 volt motor. Includes top cover. Serial# LS60-481-54. 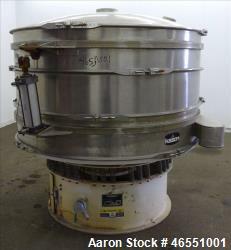 Used- Sweco 60" Vibro Energy Separator, Model US60S88, Stainless Steel. 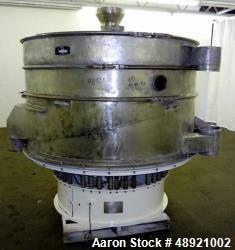 Used- Sweco 60" Vibro Energy Separator, Model US60S88, Stainless Steel. Single Deck. Driven by a 2.5hp, 3/60/460 volt motor. Includes top cover. 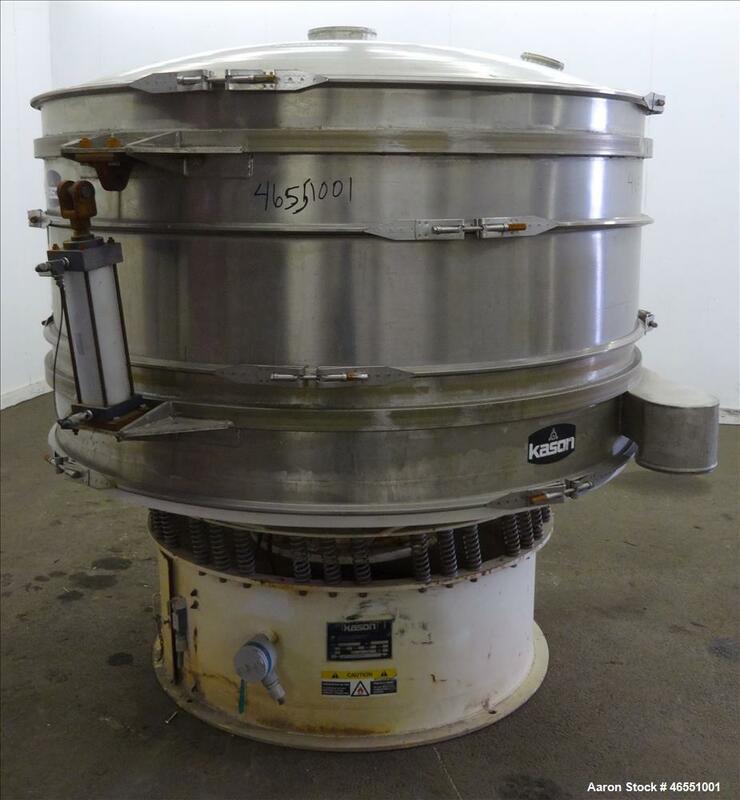 Used- Sweco 60" Vibro Energy Separator, Model LS60S88, Stainless Steel. 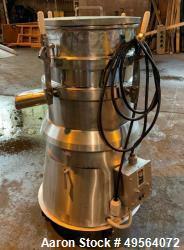 Used- Sweco 60" Vibro Energy Separator, Model LS60S88, Stainless Steel. Single Deck. Driven by a 2.5hp, 3/60/460 volt motor. Includes top cover. Serial# LS60-1185-64. Used- Sweco 60" Vibro Energy Separator, Model LS60C88, Stainless Steel. Single Deck. Driven by a 2.5hp, 3/60/460 volt motor. Includes top cover. Serial# LS60-276-64. 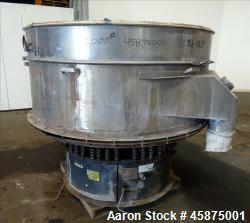 Used- Sweco 60" Vibro Energy Separator, Model LS60S88, Stainless Steel. Single Deck. Driven by a 2.5hp, 3/60/460 volt motor. Includes top cover. 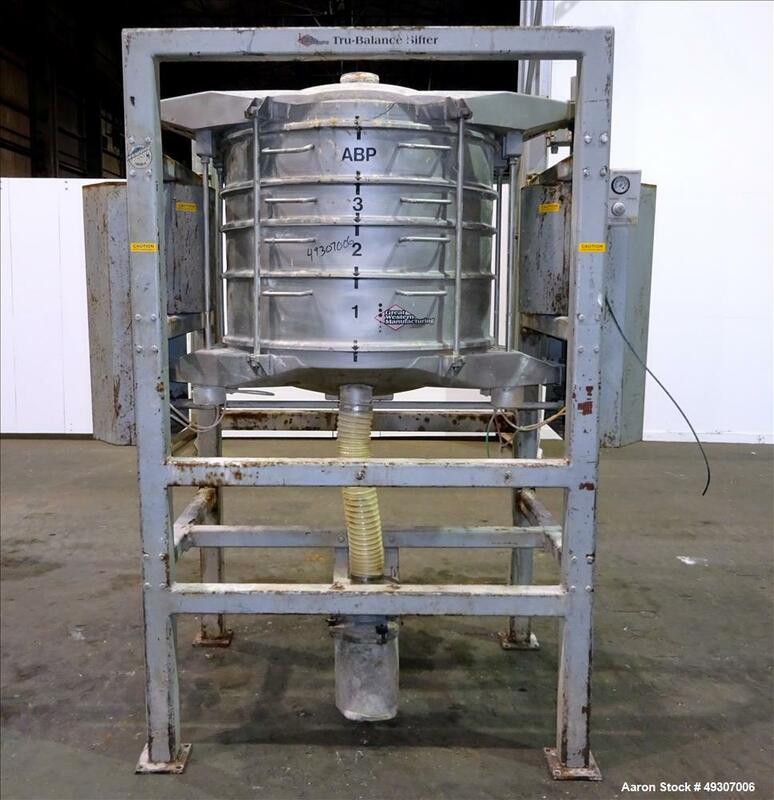 Used- Kason In-Line Pneumati-Sifter, Model K60-2PS-CS, Carbon Steel. 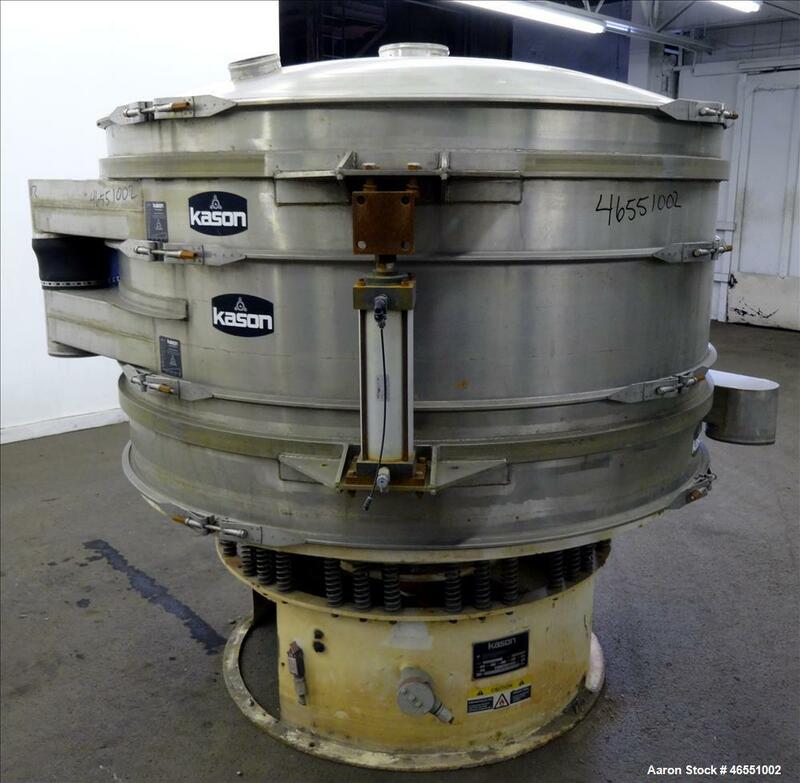 60" diameter, single deck, 2 separation. Pneumatic lift dished top cover, bottom separation with coned hopper. 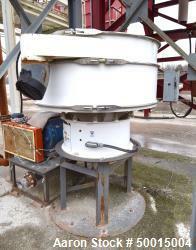 Driven by (2) 1.25 hp, 3/60/230/460 volt, 1800 rpm vibratory motors. Mounted on a carbon steel base. Serial# M-5730. Built 2001. 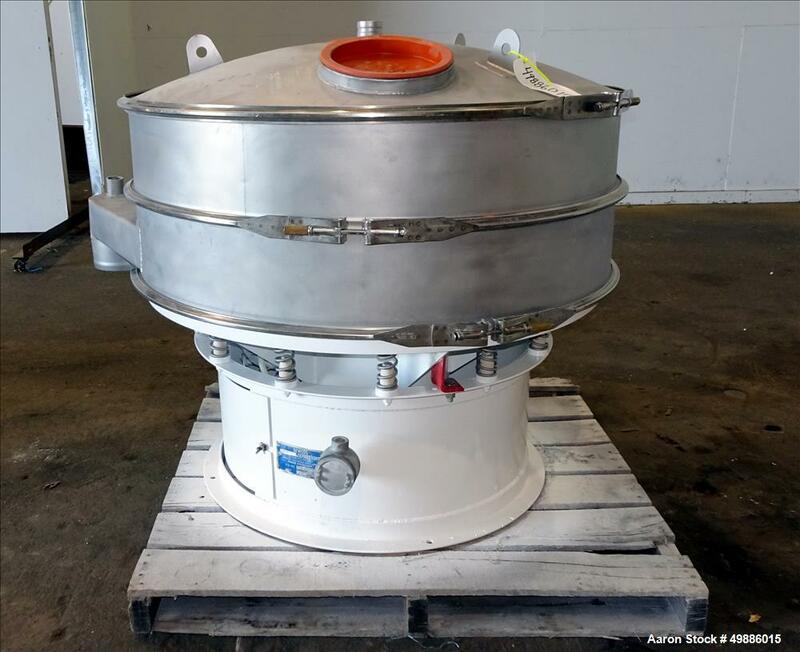 Used- Kason Vibrating Screen Separator, Model 72-2AD-SS, 304 Stainless Steel. 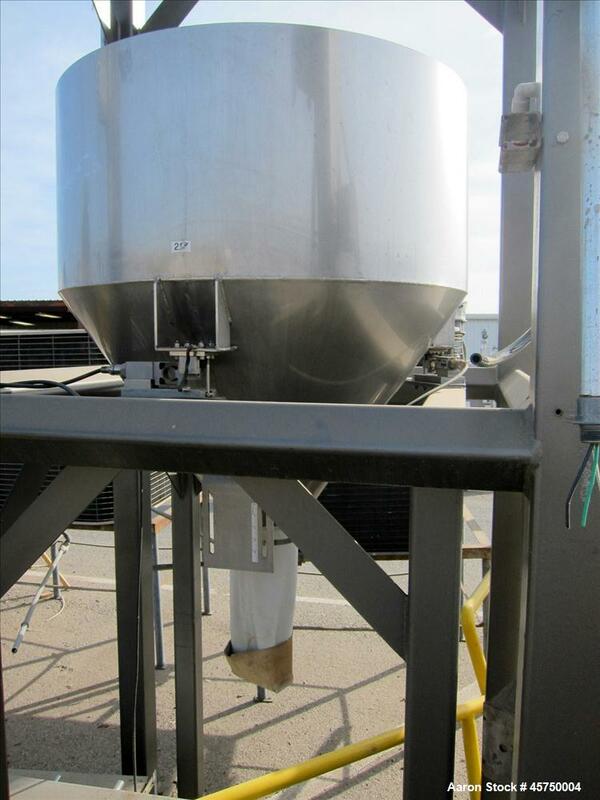 72" Diameter, single deck, 2 separation, no top cover. Driven by a 2hp, 3/60/230/460 volt motor. Mounted on a carbon steel base. Serial# KON7010. 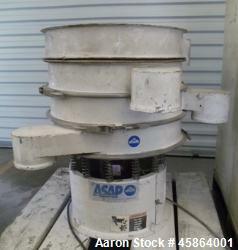 Used- Kason Screener, Model K72-2-SS, 304 Stainless Steel. 72" Diameter, Double Deck, 3 separation, with top cover. Driven by a 2 hp, 3/60/575 volt, 1200 rpm motor. Mounted on carbon steel base. Serial# C10820. Used- Kason Screener, Model K72-2-SS, 304 Stainless Steel. 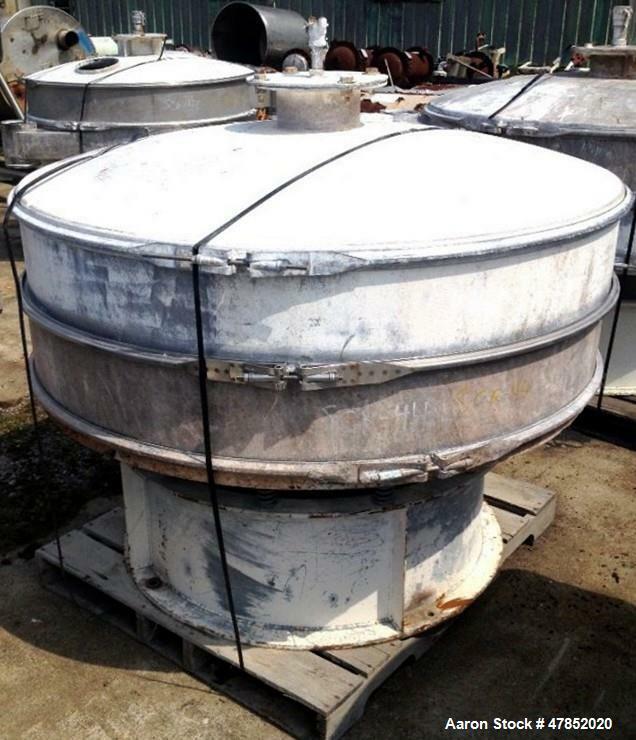 72" Diameter, Double Deck, 3 separation, with top cover. 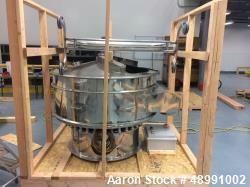 Driven by a 2 hp, 3/60/575 volt, 1200 rpm motor. Mounted on carbon steel base. Serial # C10819. Used- Kason Screener, Model K-72-2-SS, 304 Stainless Steel. 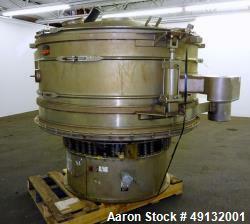 72" Diameter, double deck, 3 separation. Stainless steel top cover. Driven by a 2hp, 3/60/220/440 volt, motor. Mounted on a carbon steel base. Serial# KC-1063. 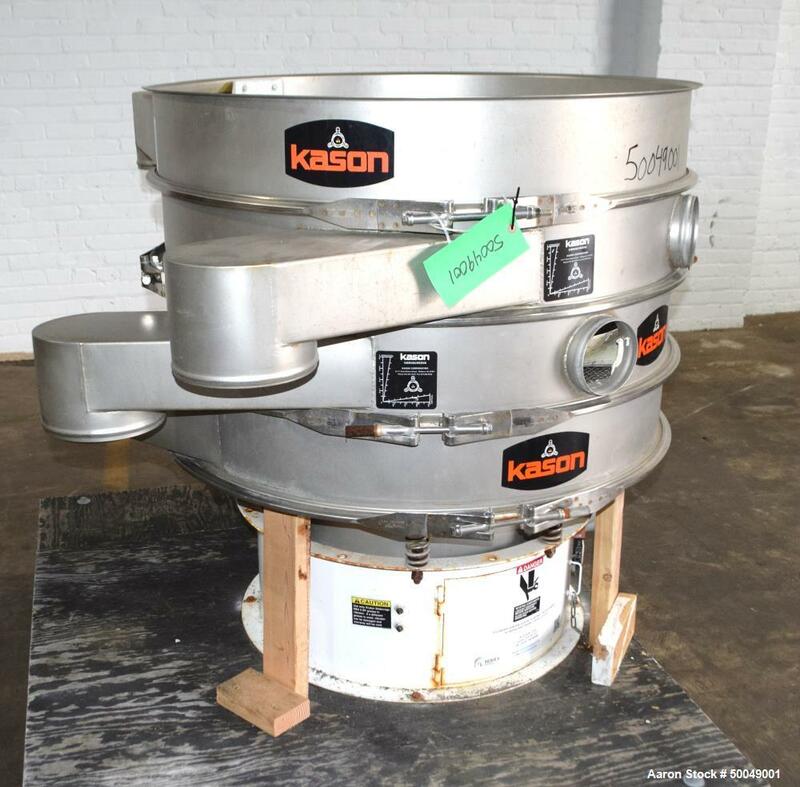 Used- Kason Screener, Model K72-2-316LSS, 316L Stainless Steel. 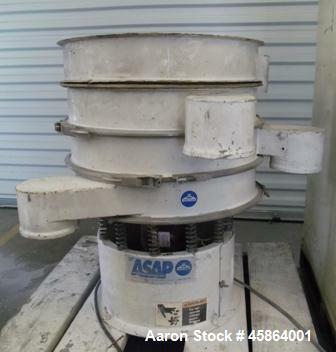 Used- Kason Screener, Model K72-2-316LSS, 316L Stainless Steel. 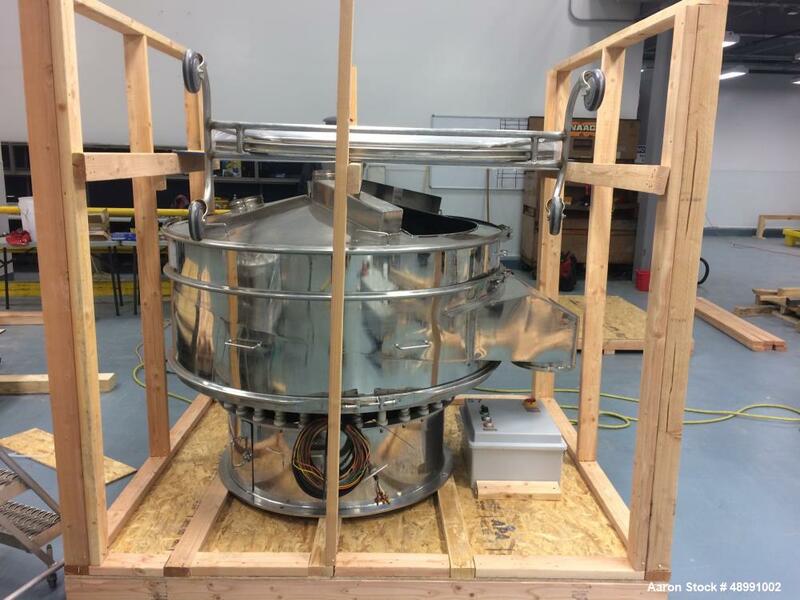 72" Diameter, Double Deck, 3 Separation. Driven by a 5 hp 3/60/230/460 volt motor. Top Cover. Mounted on a base. Serial# M8018. Built 2008. Used- Great Western Manufacturing Tru-Balance Screener, Type TB, Model 611/4 (QA30), 304 Stainless Steel. 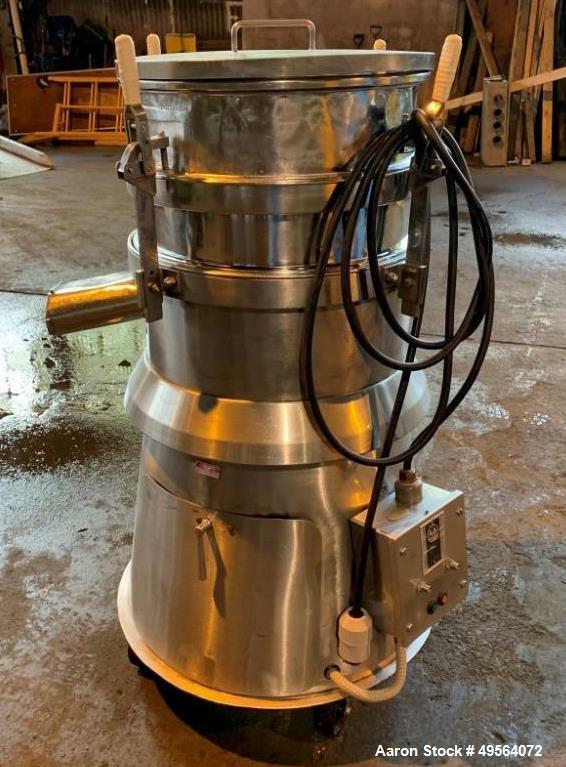 Approximate 500 pounds per minute with wheat flour. 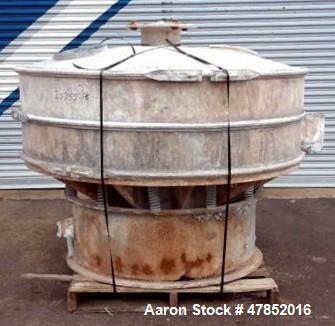 Approximate 30" diameter, (4) sieves. Approximate net sieving area 15 square feet. Driven by a 1.5 HP, 3/60/230/460 volt, 1160 rpm motor. 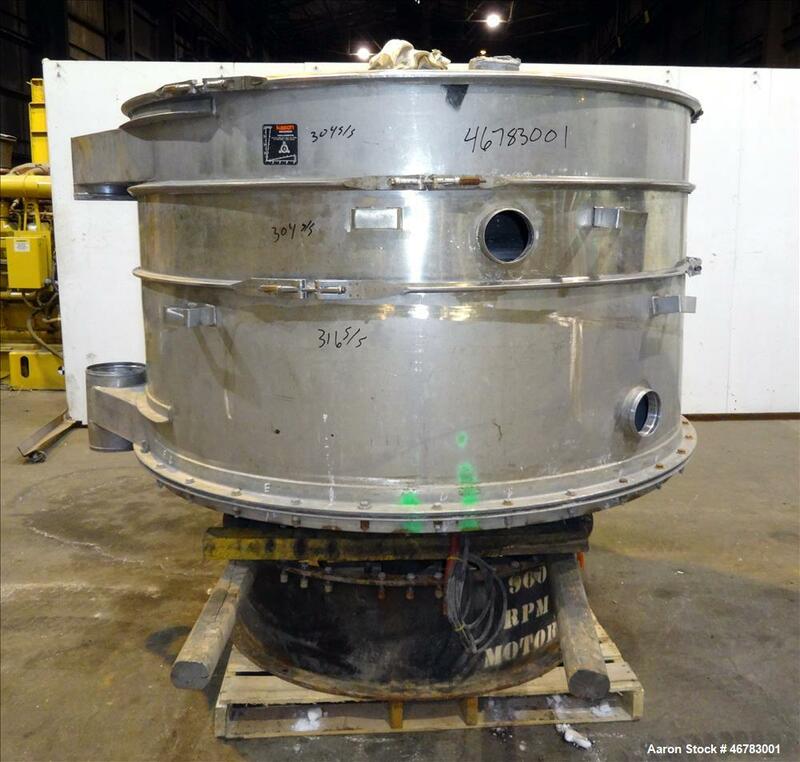 5" top opening, bottom openings: 5", 4". Mounted on a painted carbon steel frame. Serial# 3882. Built 1999. 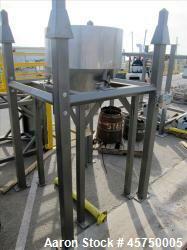 Used- Great Western Manufacturing Tru-Balance Screener, Type TB, Model 611/4 (QA30), 304 Stainless Steel. 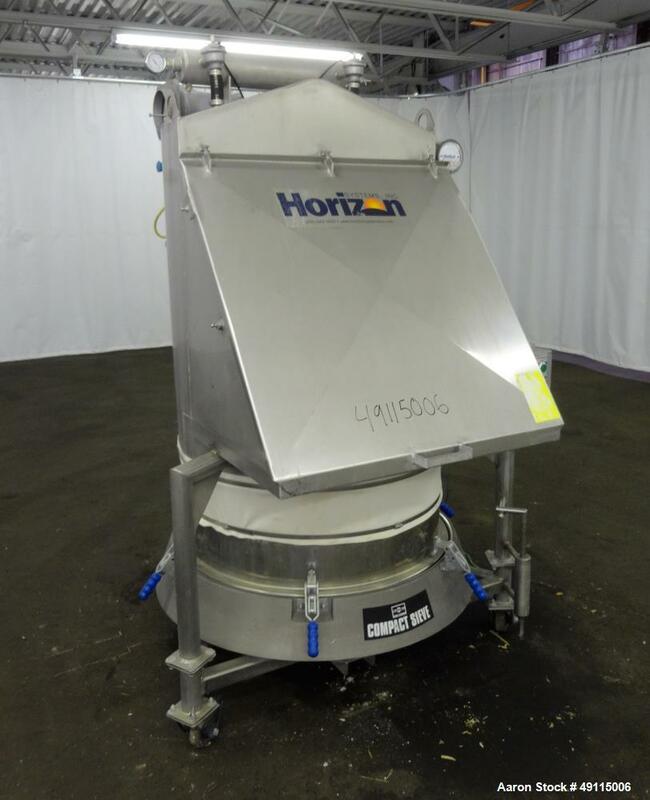 Approximate 500 pounds per minute with wheat flour. 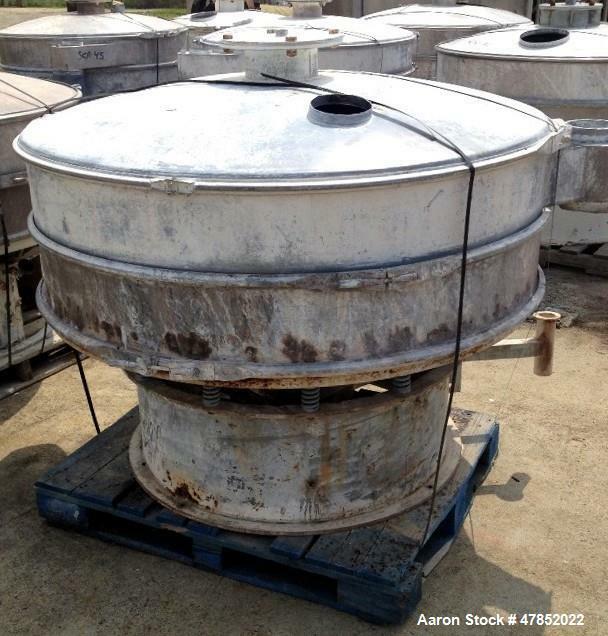 30" diameter, (4) sieves. Approximate net sieving area 15 square feet. Driven by a 1.5 HP, 3/60/230/460 volt, 1160 rpm motor. 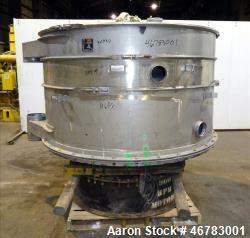 5" top opening, bottom openings: 5", 4". Mounted on a painted carbon steel frame. No Serial #. 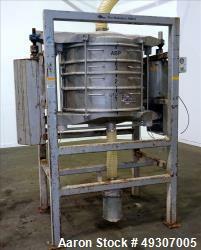 Used- Russell Finex Compact Sieve, Model 17900, 304 Stainless Steel. 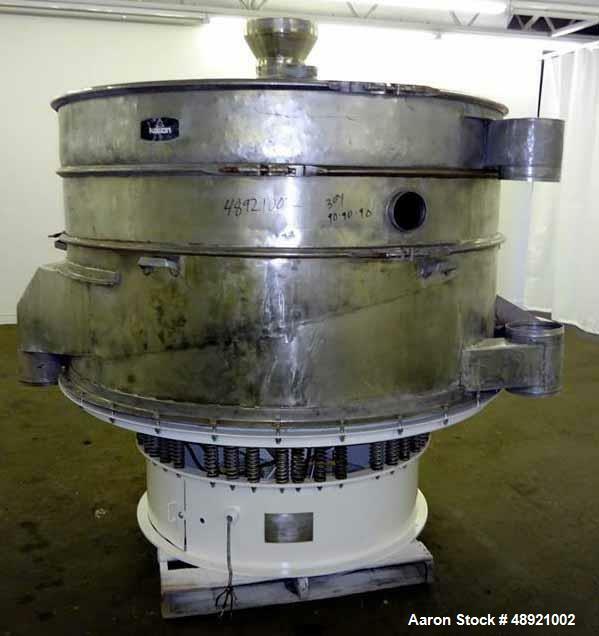 Approximate 36" diameter, single deck. 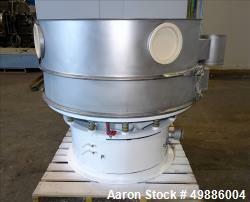 Driven by 1.2 hp, 3/60/230/460 volt, 1800 rpm motor. 10" center bottom outlet. Built 2010. Serial # JT1014. 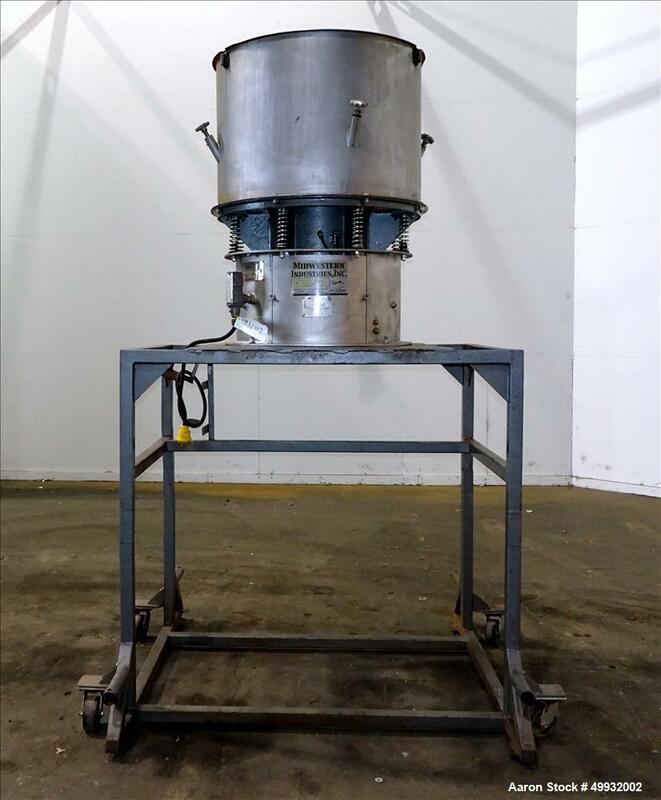 Includes top mounted Horizon Systems dust collector, Model XFO6BDIDCRS, with Cincinnati Fan blower, Model PB-12A, driven by 3 hp, 3/60/208-230/460 volt, 3450 rpm motor. Mounted on a frame with casters. Was Last used on food ingredients. 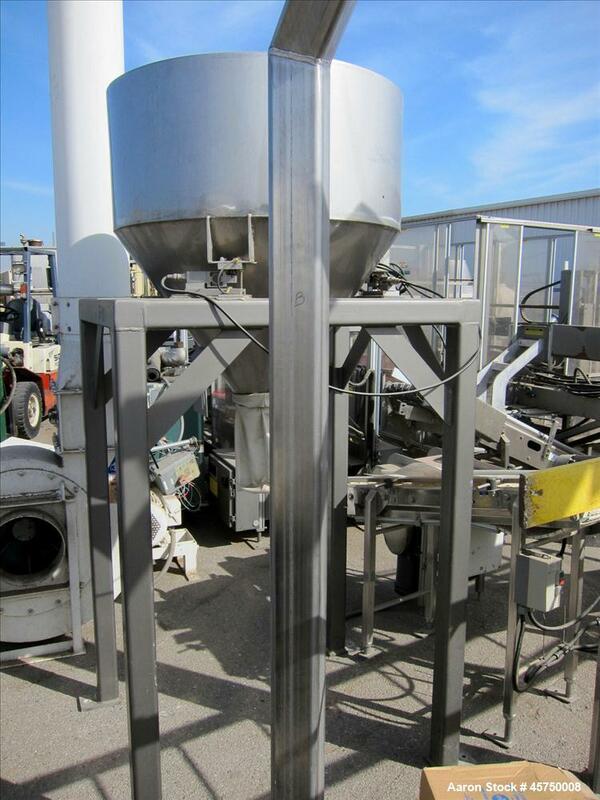 Used- Sweco Pneumatic In-Line Pressure Sifter, Model PS60S241212, 304 Stainless Steel. Double deck design with (2) approximate 60" screens with ball cleaning, and (2) approximate 48" diameter screens with ball cleaning. Clamp on 1 piece top cover with inlet, side bypass tube connections, side overs outlet with collection can. 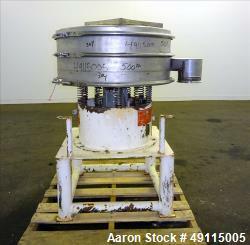 Driven by a 5hp, 3/60/460 volt, 1200 rpm XP motor. Mounted on a 13" tall carbon steel base. Serial# 666747-A1097.